Epson has always bucked the inkjet printing trend, using cool-running piezo-electric print heads to get the ink onto the paper, instead of boiling it in the conventional thermal fashion. The company claims this gives greater freedom when it comes to formulating inks, as the consideration of a rapid boiling and cooling cycle is taken out of the equation. The latest in a long line of dedicated photo printers, the PX710W uses Epson's most recent generation of 'hummingbird' Claria dye based inks, and there are six individually replaceable cartridges in the conventional photo-friendly line-up of cyan, magenta, yellow and black, plus light cyan and light magenta, intending to extend the colour gamut for greater photographic accuracy. All six of the PX710W's inks are dye-based, enabling a premium finish on glossy photo papers. With the lack of a pigment-based black ink, or a resin-based DuraBrite black ink, as used in Epson's SX600FW printer, the creation of high-quality mono text is a challenge for the PX710W. However, while it can't compete with printers like the Canon MP640 and HP C309G on this front, black text is still reasonably crisp, suffering less from a faint greyish affair than with some of Epson's older photo printers, making it more viable as an all-rounder. Mono text pages are fairly cheap to create as well, despite the lack of a high-capacity mono cartridge. There's certainly no shortage of connection options, the PX710W boasting both Ethernet and Wi-Fi, along with USB 2.0, PictBridge and a wide range of media card slots including CompactFlash, SD, SDHC, MMC, MS and xD. 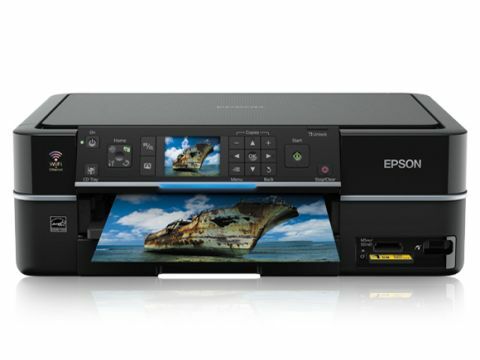 Epson's usual 5760 x 1440dpi print engine is coupled with a high-resolution 2400 x 4800dpi scanner with standalone functions like photocopying and direct printing from memory cards being brought together by a, frankly, huge control panel. It lacks the more adventurous touchscreen option featured by the likes of the Lexmark S605 and HP C309G but the 6.3cm colour LCD is bright and clear, and the plethora of buttons sprouting from the front panel keeps things fairly intuitive, even if it does put your dexterity to the test. Switching between plain and photo paper is a bit of a chore and, while there's a secondary input tray, this can only accommodate small-format photo paper rather than full A4 sheets. Automatic double-sided printing is also off the menu, unless you buy Epson's optional Auto Duplex unit. Photo print speed is very quick in normal quality photo mode, with 6 x 4-inch prints taking around 20 seconds to produce. Previous Epson models like the Stylus Photo P50 basic printer and PX650 all-in-one were notorious for their tardiness in top quality photo print modes, making you wait for about five minutes while they served up a borderless A4 print. The PX710W proved considerably quicker in our tests, at just under three minutes, which is on a par with the HP C309G but still rather slower than the Canon MP640 or Lexmark S605, which do the same job in under two minutes. The bottom line for any dedicated photo printer is the actual quality of photo prints. The PX710W is a bit of a mixed bag in this respect, because while photos are typically very bright and vibrant, contrast can be artificially high and some of our test shots lost detail in shadowy areas of scenes as a result. Meanwhile, skin tones can be a little on the cool side and rather less flattering than with the Canon MP640.